The properties of KRION make the solid surface from PORCELANOSA Group an ideal material for the hospital sector, and with our love for our pets, why not extrapolate human needs when attending a hospital? It is a place where an additive-free antibacterial material is needed, with easy cleaning and imperceptible joins, which is not affected by chemical products; such as KRION. 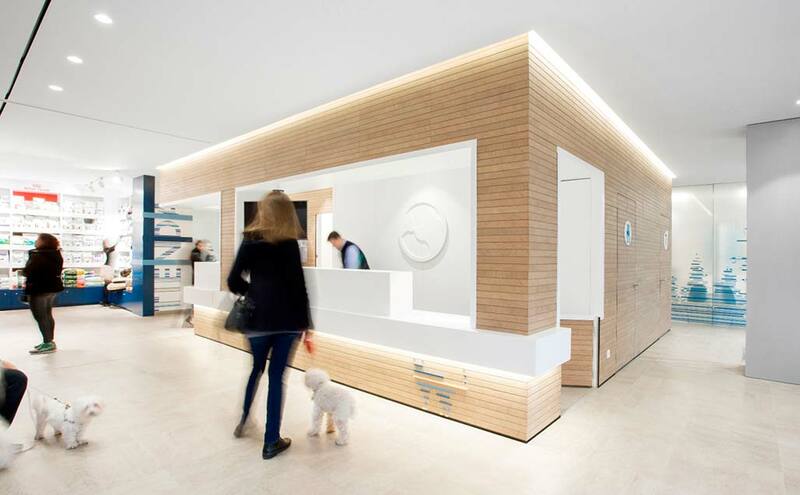 Demonstrating respect for animals, thanks to the Dobleese studio, Hospital Veterinario Constituciónhas used KRION for its new establishment in the Valencian capital. The professional team of Hospital Veterinario Constitución undergoes continuous training, and use their experience to benefit our pets, providing professional advice for owners. For the design of its new facilities, it has relied on Dobleese, a studio specialised in corporate and residential design, led by Sara Sánchez, licenced interior designer and member of the governing board of the CDICV (the Association of Interior Designers and Decorators of the Autonomous Community of Valencia). The studio was in charge of using KRION to design the reception counter, the vertical coverings and corporate logo, along with the bathroom countertops and the horizontal surface of the treatment room, which the transformer company Kapps Krion Aplications created with the material KRION 1100 Snow White.